New Delhi: Acting on Congress leader Navjot Singh Sidhu’s request, the Imran Khan-led government has decided to not build any structure on the fields surrounding the Kartarpur Sahib Gurdwara and preserve it as it is. 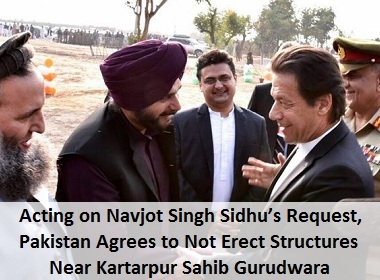 Punjab Local Bodies’ Minister Navjot Singh Sidhu had written to Pakistan Prime Minister Imran Khan, mentioning that the fields around Kartarpur Sahib Gurudwara were cultivated by Guru Nanak Dev himself and should be retained. Accepting Sidhu’s plea, the Pakistan government in its reply assured that no structure will be erected near the Gurudwara. Earlier on Tuesday, India and Pakistan held a technical meet to discuss alignment of the Kartarpur corridor, the coordinates and engineering aspects of the proposed crossing points, government sources said. They also conducted a survey of the site after a meeting of engineers and surveyors. The outcomes from the meeting and survey would be further discussed at the next meeting of the two sides on April 2. The Kartarpur Sahib Gurudwara in Narowal district of Pakistan’s Punjab province, located 4.5 km from the border near the Dera Baba Nanak town in Punjab’s Gurdaspur district, is significant for the Sikh community as it is here that Sikhism founder Guru Nanak Dev spent 18 years of his life and is his final resting place. The governments of India and Pakistan are trying to facilitate the travel of pilgrims to offer prayers at the Gurdwara — a demand made by the Sikhs for the past over 70 years.